You construct a relative ratio line by dividing one security into another. This allows you to objectively compare the performance of one security relative to the other, because the line rises when the primary security is ­outperforming the second one and falls when it is underperforming. 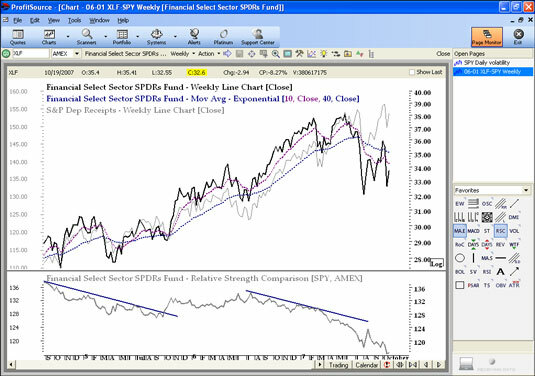 Adding an overlay chart to a relative ratio allows you to view both securities on one chart. Log scales typically provide a better view for the movement of each. Trend lines drawn on a log chart will appear differently when you switch to an arithmetic scale. The figure displays a weekly log chart for XLF (dark solid line), an exchange-traded fund (ETF) comprised of S&P 500 financial companies. It also displays an overlay of SPY (light, thinner line), which is the S&P 500 Index ETF. The 10-week and 40-week EMAs (two dashed lines) are also included for XLF, displaying intermediate- and long-term trends, respectively. Finally, the bottom portion shows the relative ratio line for XLF/SPY. Shorter moving averages measure a shorter time period and move more closely with price, and thus are used to smooth out shorter-term trends. You can distinguish these lines on a chart because they are somewhat jagged. When including relative ratios on a chart, you have a clearer view of the performance for two securities. At plain sight, it appears that the two indexes moved pretty similarly until the latter part of the time period charted. But a look at the relative ratio line tells another story. Throughout a good portion of the three-year period pictured, SPY outperformed XLF, very significantly from June 2007 through October 2007, a period that preceded the first down leg of the U.S. market in relationship to the subprime mortgage crisis. Thus, this type of analysis was good for both evaluation of XLF, but also hinted that financial stocks were starting to weaken. Relative ratio lines are commonly referred to as relative strength comparisons. The chart also shows that the indicator was timely, because within a month after the deterioration in the relative ratio line, XLF dropped below its 200-day EMA and shortly after the 50-day EMA followed. Although not labeled, the shorter EMA is identified by noting which one moves more closely with the price. When downward-trending conditions are ideal, prices and MAs line up with price data appearing lowest on the chart followed by the shorter EMA, and then the higher EMA — just as the figure is showing. Some traders use moving average crosses as trading system signals. This approach has its place in trading, but note where price was when the cross occurred — almost at its lowest point. Remember, moving averages lag price data. Moving average crossovers are better used as trend confirmation, but not necessarily as timing tools. Thus, relative strength lines can be used as leading indicators and moving averages as confirmation. Once that negative cross occurs, it makes sense to favor bearish strategies. Draw uptrends using the low points in the trend. Draw downtrends using the high points in the trend. Also, previous areas of support can become resistant and vice versa. When using overlay capabilities on a chart, indicators added to the chart are based on the primary security. When using relative ratios, it’s good to identify a group of related indexes or sectors to monitor. Cash flows from one outperforming market or sector to another as economic conditions and market perceptions change. Portfolio allocations should favor outperforming markets and underweigh underperforming ones. The wide range of ETFs that track different assets (for example, the U.S. dollar or oil) allow you to employ an asset allocation plan across markets using a single security type. Add the existence of options for many ETFs, and you have reduced risk access to the commodity and foreign exchange markets. Trend lines can be used on relative strength comparison lines to better identify changing conditions and areas of support and resistance. Similarly, support that has been broken will often serve as resistance in the future. SPY tracks the entire S&P 500 Index. Nine ETFs track each of the nine major sectors that make up the index. Collectively, the nine sector ETFs make up the SPY ETF. By analyzing ten charts, you can complete a broad market and sector assessment, which can serve as a basis for comprehensive sector investing or trading. Thus, seeking an ETF fund family that is liquid and optionable is crucial and should be your first objective — then you follow up by confirming liquidity in the ETF options. A relative ratio line only compares performance of two securities — it does not indicate the trend for either security. A rising line can indicate the primary security is trending upward at a faster rate than the second security or that it is trending downward at a slower rate.